Google is beginning to roll Google Assistant out to more smartphones. Unfortunately, the majority of Android handsets are not included in this initial rollout. However, seeing as Google Assistant was previously only available on the Google Pixel Google Pixel XL Review and Giveaway Google Pixel XL Review and Giveaway Google's first branded device delivers one of the best devices in the Android ecosystem: the $770 Pixel XL. The XL launched with similar specs as the $500 Nexus 6P, but is it worth $770? Read More , this is still a vast improvement. Apple has Siri, Microsoft has Cortana, and Amazon has Alexa. Judging by the popularity of these three entities, personal assistants powered by artificial intelligence are clearly all the rage. However, Google has been rather slow to capitalize on this trend. Google Now is, well, OK, Google, but it lacks that human element which makes the aforementioned stand out. Which is why Google introduced Google Assistant. Originally released on the Google Pixel, Google Assistant is now venturing out into the wider world. Starting this week, Google will roll Google Assistant out to millions of smartphones via an update to Google Play Services. Google’s ultimate goal is to “make the Assistant available anywhere you need it,” and it’s starting with smartphones running Android 6.0 or Android 7.0. English-speaking users in the U.S. will get Google Assistant first. Followed by English-speaking users in Australia, Canada, and the U.K., and German speakers in Germany. Google is promising to add support for more languages besides English and German over the next 12 months. 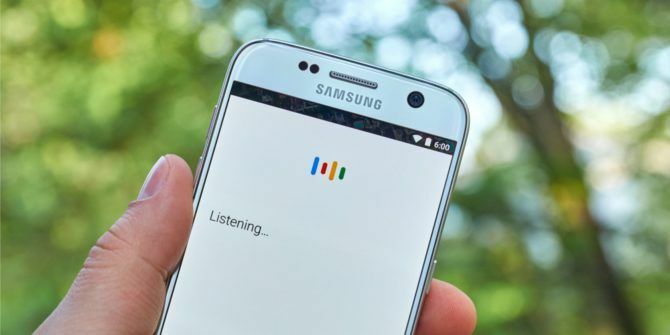 This update means Google Assistant will now be made available to millions more users. However, even Google admits only around 30 percent of Android handsets currently run Marshmallow or Nougat. Which means the vast majority of users aren’t being invited to the party just yet. As well as rolling Google Assistant out to eligible smartphones already out in the wild, Google is making it a default app on new Android handsets such as the LG G6. But it looks very unlikely Google Assistant will ever come to Android handsets running Lollipop or KitKat. For the uninitiated, Google Assistant essentially replaces Google Now, and you access it in the exact same way (by saying “OK, Google” The Master List of "OK, Google" Commands The Master List of "OK, Google" Commands Google Now has tons of useful commands, but how do you keep track of them all? Here's a master list, organized by category, so you can control Google how you like. Read More or by long-pressing the Home button). However, Google Assistant features a conversational user interface which makes it more friendly to interact with. As you’ll probably soon find out. Is your smartphone getting Google Assistant? Are you excited at the prospect of trying Google’s new AI? Or are you annoyed at being left out? If you already have Google Assistant, how does it compare to Siri, Cortana, or Alexa? Please let us know in the comments below! Explore more about: Android, Android Marshmallow, Android Nougat, Google, Google Assistant. Both me and my son have a OnePlus 3. My son has Google Assistant I don't!! Why is this??? It's coming to Android phones running Marshmallow, but only in the countries listed in the article. I'm sure it will be launched in India at some point in the future, but not yet. I'm truely feeling restless to get the update. I've tried a lot to enable google assistant on my Panasonic phone but all in vain as my device can't be rooted easily. But when google itself gives a chance to maximum people to use google assistant officially then I feel like I'm in 9th cloud.... Now just waiting for the update.?? Also I know the feeling of waiting, I would root my device if it weren't prone to breaking so now I wait... I guess the Google now launcher is fine for now. I'm truely feeling restless to get the update. I've tried to enable google assistant on my phone but all in vain as my device can not be rooted easily. But when google gives everyone a chance to use google assistant then it's like I'm in the 9th cloud.... Now just waiting....?? Indian users are not in list? Nope, not at the moment. Google can't cover all languages at once so they're obviously focusing on English and German first. Not until they change the frase from "OK Google" to something more human friendly and hopefully something easier on the tongue. And I don't want to say a company name to use it. I want a normal name, like Siri or Alexa. Both sound and feel much better and normal. People at Google; would you say "OK Microsoft"? How is saying OK Google hard/not human friendly? How is Siri or Alexa a normal name? It's a little bit different than saying "OK Microsoft" because the word "Microsoft" is not virtually synonymous with search. Google isn't just the name of the company, it's now a verb for searching the web. Lots of people even say "I'll google it" when using other search engines. It's practically a verb. How do I take the Google assistant spyware out of my phone?